The manager’s press conference ahead of the Chelsea game took place yesterday. My favourite bit was his face at around 8’35 in when it’s put to him that Mourinho is something of a ‘tactical genius. I tried to do a screengrab but it doesn’t lend itself to that – you need the animated GIF experience and I’m not sure how to do that and I just can’t be arsed learning at this time of the morning. You can watch it yourselves here. Anyway, the team news is that Per Mertesacker hasn’t trained all week and is 50-50 for Sunday. If I were a betting man I’d say we’re going to have to do without him, which is a bit of a blow because he and Koscielny look to have settled into a very nice rhythm recently. Maybe we can give him an injection or something but we run the risk then of doing further damage, and with Gabriel in the squad now the need isn’t as pressing as it might have been. Mikel Arteta is back in full training but unlikely to be anything more than a substitute if he’s involved, while Alex Oxlade-Chamberlain remains sidelined and reports this morning suggest that his season is done due to the groin injury he’s suffering with. It was interesting how much football he’d played this season until the injuries kicked in. It felt like the manager was starting him on a much more regular basis and not just because he had to either. He’s still to nail down a single position as his own, the versatility is both a help and a hindrance to an extent, but I think he’s made real progress. It’d be a shame if his season was over, but if there’s a problem that needs fixing, it’s not as if we don’t have the depth to cope right now. We should get him back fit and ready for August and I suspect he’s going to become an important cog next season. I want Cesc Fabregas when he comes to the Emirates on Sunday to be respected like he deserves. Which, when you read it properly, is quite open ended. I mean, I think the manager genuinely wants former players to be remembered for what they did on the pitch rather than how they left, even if it was contentious, but he often phrases it in such a way that it leaves it very open for people to take their own interpretation from it. Different people will feel he deserves a different reception, but it’s all part of the pantomime of football. Stories this morning about how he hasn’t spoken to the former captain since his return to England are little more than the papers adding a bit of extra spice to a situation that doesn’t really need it. What are they going to do? Spend hours on the phone reminiscing? It’s all nonsense. And of course there’s the issue of the managers. They’re never going to be friends – Tim Stillman touches on the two in his column this week – and obviously after the touchline shenanigans at Stamford Bridge the media, and every neutral, will be hoping it all kicks off again and we can witness the Chelsea manager cower away from a 64 year old man. It’s not a confrontation of two managers, it’s a confrontation of two clubs, two teams. What is important is when the game starts at four o’clock, to have a great game. That’s what English football needs, to know that Arsenal against Chelsea is a big game and is not about the relationship between the managers. Naturally, I’m not concerned in the slightest about what English football needs. What I need is for us to win this game, to get that Mourinho monkey off our back then to boot the monkey in its monkey balls then put it in a car, go speeding off down a motorway then throw it out the window and see how good it is at dodging traffic (hopefully not very – like your Grandad playing his first game of Frogger). We shall see how it all plays out, but right now it’s time for this week’s Arsecast and I’m joined by Dan Levy of France24 to discuss getting to the FA Cup final, Olivier Giroud and the progress he’s made as player this season and the reasons behind that, the Chelsea game this weekend and the return of that Spanish fella. There’s all the usual waffle in there too and perhaps a little rant about the source of all the world’s evil or something. 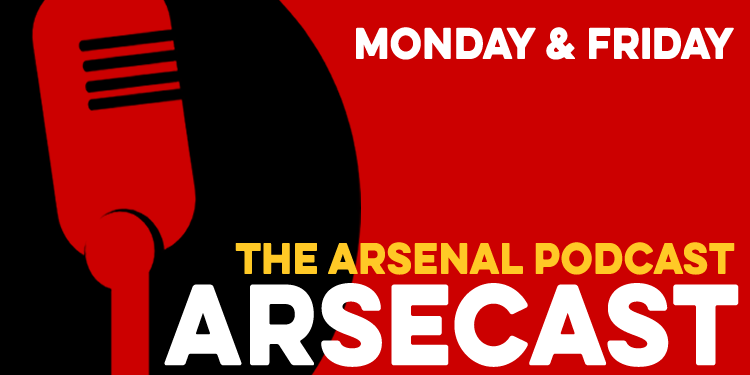 To download this week’s Arsecast directly click here – 31mb MP3. The Arsecast is also available on our SoundCloud channel, as well as via the SoundCloud app for iPhone and Android. You can now also find it on the Stitcher podcasting app for iOS and Android. Or, you can listen without leaving this page by using the player below. Right so, that’s your lot for today. The Gent will be here later on with his weekly review, more from me tomorrow.